^ Global Peace Index - Methodolgy, Results & Findings (PDF). [July 1, 2007] （英语）. ^ First Global Peace Index Ranks 121 Countries. [July 1, 2007] （英语）. ^ Global Peace Index 2018 (PDF). visionofhumanity.org. Institute for Economics and Peace. ^ Institute for Economics and Peace. Global Peace Index 2016 (PDF). Visionofhumanity.org. 2016. ^ Institute for Economics and Peace. Global Peace Index 2015 (PDF). Visionofhumanity.org. 2015. ^ Institute for Economics and Peace. 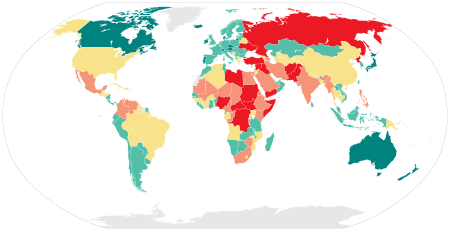 Global Peace Index 2014 (PDF). Visionofhumanity.org. 2014. ^ Institute for Economics and Peace. Global Peace Index 2013 (PDF). Visionofhumanity.org. 2013. ^ Institute for Economics and Peace. Global Peace Index 2012 (PDF). Visionofhumanity.org. 2012. ^ Institute for Economics and Peace. Global Peace Index 2011 (PDF). visionofhumanity.org. 2011. ^ Institute for Economics and Peace. Global Peace Index 2010 (PDF). visionofhumanity.org. 2010. （原始内容 (PDF)存档于2017-03-26）.